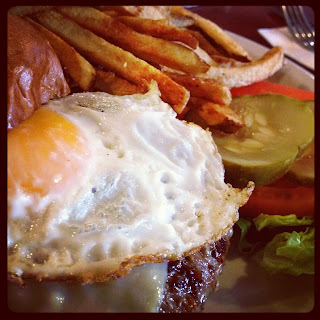 Charm City Cook: Which Came First, the Chicken or the Egg? When I got the chicks from Joan last summer, the city allowed you to keep four hens. And just a few months ago, I heard it had raised the number to 10. Ten? What? Hmmmm. 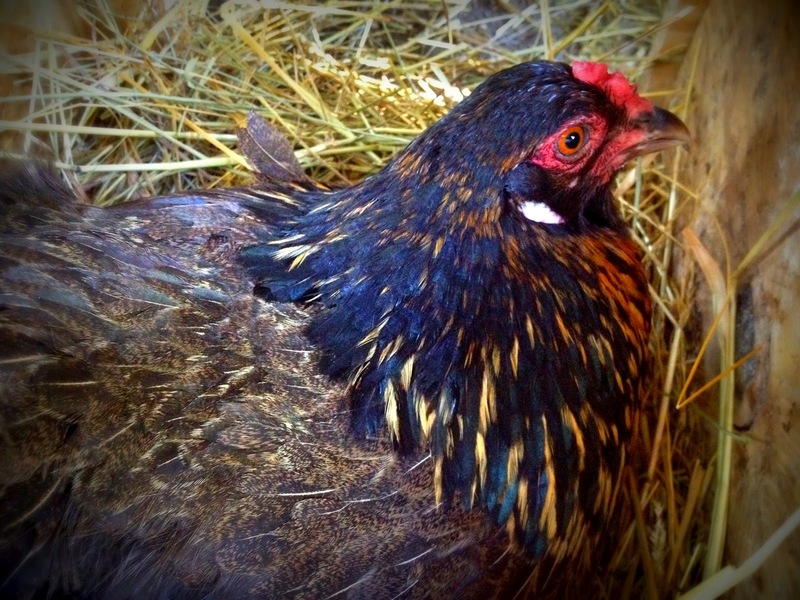 After a few hens turn into roosters (three…but who’s counting? ), I ended up with three hens and I thought I was okay with that. But I kept thinking about it. I could get a few more…and make a few adjustments to the coop? Could I deal with ten? No. Not only is that a lot of eggs, it’s a WHOLE lotta mess. But I decided to move ahead and get a few more girls. 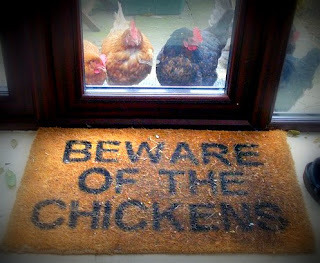 A few friends said they’d found chickens locally via Craigslist. I thought I’d give it a try and found a great listing by a farm out in Harford County that had about twenty different breeds of chicks and five breeds of pullets (young chickens). I was so excited! Then a friend told me that she had purchased chickens from this very farm and the new chickens brought disease into her coop and ALL of her chickens died. As incredibly sad as I was for her, I was equally thankful she had shared the news. Dodged a bullet. So, there I went…online to research hatcheries and breeds based on egg color, egg production, hardiness, disposition and of course, appearance. 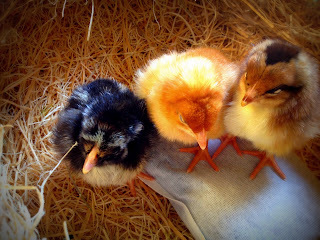 I found four breeds I really liked – Speckled Sussex, Australorp, Silver Laced Wyandotte and Golden Buff (which lays more eggs than the Buff Orphington I thought I wanted). They all lay brown eggs, most laying an average of five eggs per week. 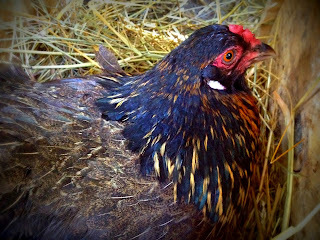 Then, a few days later, I got wigged out at the idea of seven chickens in my backyard and canceled the Australorp. The folks at Meyer Hatchery were wonderful — provided great advice and service — and their minimum order is just three chicks. Perfect for the faux urban farmer! The chicks arrived three weeks ago. IN THE MAIL. The hatchery sends them to the closest post office to you and you have to pick them up immediately. You think, mail? Really? Yes. The chicks have enough nutrients from the yolk of the egg they were born in to live for a few days without food or water. The girls hung out with me at work and everyone came to see them. They were like little rock stars. For now, Lucy, Nellie and Weesa are living in an old lobster crate in my dining room, just like my girls did last year. In the meantime, my friend Rob (God love him…he’s talented, easygoing and loves animals) is going to build a small coop for the chicks to move into outside. It will be separate from the mature hens until they are ready to be introduced to the flock. That probably won’t happen until the end of the summer. We’ll see. That is the hardest part. When you mess with the established pecking order, it can be a little scary, but you need to let nature takes its course. In other words, let the girls work it out. It’s sorta like putting Lindsay Lohan, Kim Kardashian and Paris Hilton into an apartment. Mayhem. My three mature chickens are all Ameraucanas and they lay blue and green eggs…fancy! I got these beautiful Martha-esque chickens very randomly – didn’t know what they were when I chose them from the brooder (and later, when switching out roosters, by catching them in the pasture). People are always amazed by the color. And, no, different colored eggs do not taste differently. This time next year, I will be getting about three dozen eggs each week. Am I crazy? My friends know I’m not…and I will be sharing those eggs. 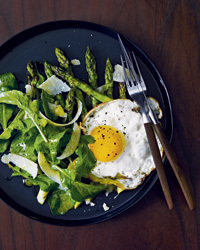 Here are some great egg recipes. 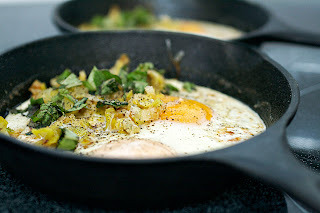 Have some for dinner, or as I like to call it, brinner. Who doesn’t love brinner?! My very favorite? A juicy burger topped with a fried egg. For a really good one, go to McCabe’s. 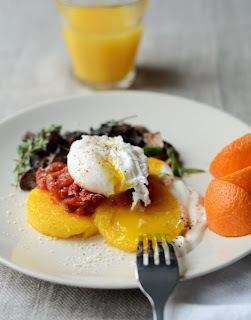 Check out these fantastic egg cooking tutorials from the fine folks at the Kitchn. If you’re not checking out this site all the time, you need to start! Considering backyard chickens? Here’s some good info…if not, you can get high-quality, fresh eggs at your local farmers market or organic market. Please also check out this little video from the folks at the Lexicon of Sustainability. It’ll make you think about your choices…I don’t mean to be preachy, just good to know this stuff. Whenever possible, please go local!